Domaine Xavier & Agnes Amirault is the newest addition to the Vineyard Brands portfolio. We are thrilled to represent this family-owned winery. A unique and deep history surrounds the estate, from the Maison Amirault's civic past to the cellar's ties to a race car driver. Located in the Loire Valley, the Amirault family has lived at Le Clos de Quarterons for over 180 years. Six generations have produced wine on this land, making quality a priority. The small village of Saint-Nicholas-de-Bourgueil is on the border between Anjou and Touraine. This area is the epitome of wine country. One-third of the village is covered in vineyards and around 100 of the less than 1,300 village inhabitants are winegrowers. Wine history in this area runs deep, with the Cabernet Franc grape first appearing in the village in 1152. There are few places you can turn in the village without encountering a bit of wine history. What is now Maison Amirault was one of the first buildings in the village- even serving as the town hall and village school. Now the house is emblematic of the estate and the wine. On each label (for the past 180 years!) the house has featured prominently. Le Clos de Quarterons is a 92 acre completely biodynamic vineyard. Certified organic and biodynamic, Xavier and Agnes are focused on creating wines that are truly natural. From soil to place, climate to varietal, and the know-how of the farmer, their goal is to achieve a natural balance across all 53 plots of the estate. While the history of the cellar is not quite as ancient as that of the grape varietal, it is quite unique thanks to how the cellar changed hands. Who is the former owner? Olivier Gendebien, a famous racing driver who won Le Mans several times. Le Mans is a 24 hour (yes, a full 24 hours) race. You can find out more about that unique event here. In the 1960s, Claude Amirault purchased a large limestone rock quarry at an auction. This quarry became a cellar, with several hundred meters of galleries allowing the estate to age the wines at a constant temperature of 13 degrees Celsius year round. Although Cabernet Franc is the main grape variety at the estate (and in the village as a whole), Chenin Blanc and Chardonnay are also grown by the Amiraults. They produce beautiful reds, whites, and sparkling wines. 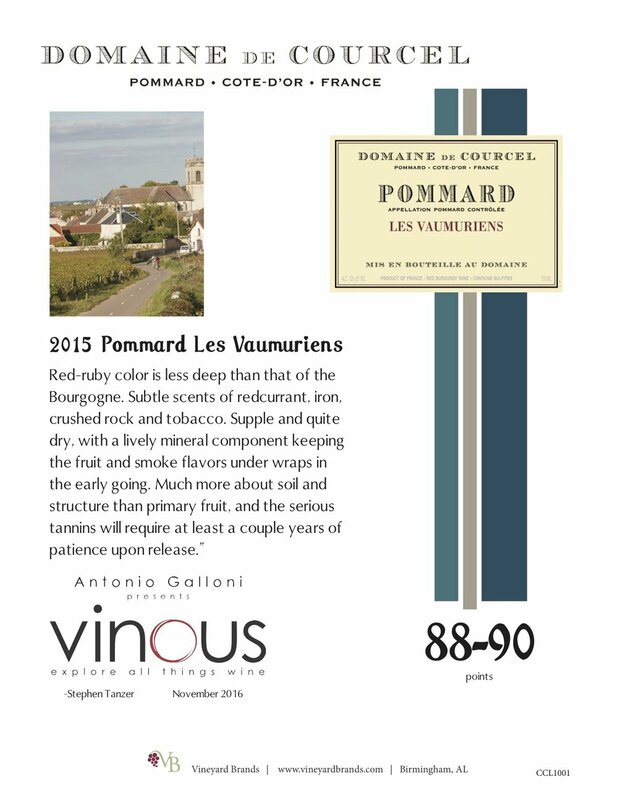 Vineyard Brands is excited to import eight wines from Domaine Xavier & Agnes Amirault: Saint-Nicolas-de-Bourgueil Le Vau Renou; Saint-Nicolas-de-Bourgueil Le Fondis; Saint-Nicolas-de-Bourgueil Le Clos Des Quarterons Vieilles Vignes; Saint-Nicolas-de-Bourgueil Les Gravilices; Crémant de Loire Amirault ; Saint-Nicolas-de-Bourgueil Les Quarterons; Saint-Nicolas-de-Bourgueil Les Quarterons Blanc; and Crémant de Loire Les Quarterons. 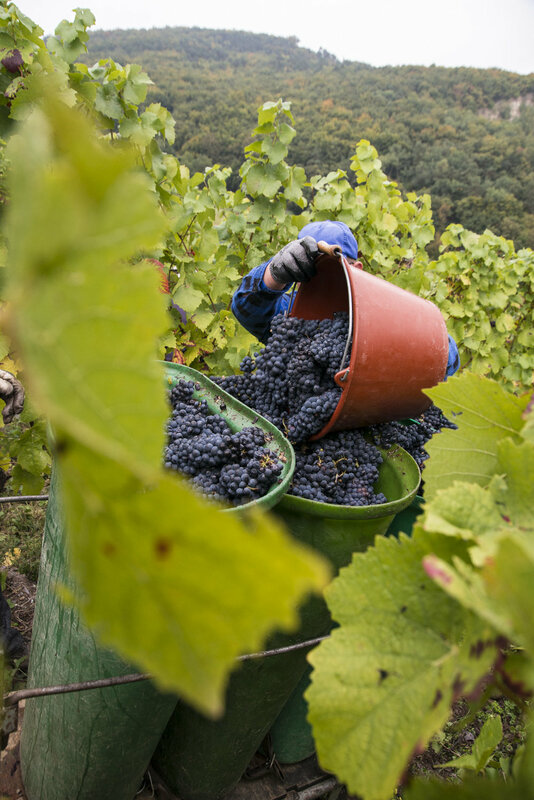 Early fall is the busiest and most important time of the year for wineries in the Northern Hemisphere- Harvest season. Long hours and intensive labor consume each and every member of the winemaking team. There is so much that goes into a bottle of wine that the consumer never sees. 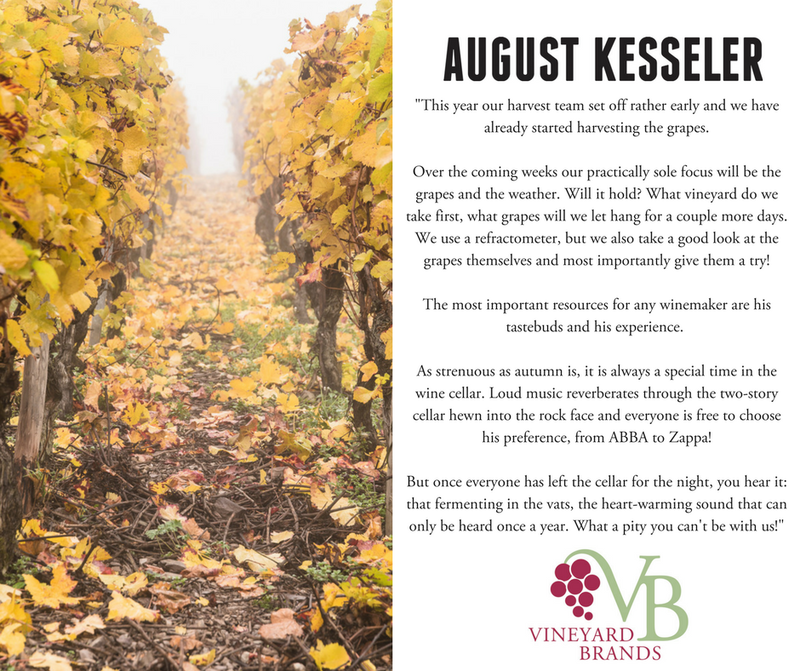 Take a peek behind the curtain and explore harvest season at a few Vineyard Brands wineries around the world. Domaine de Courcel: A 400 year old family owned winery, located in the village of Pommard on the Côte d'Or, about four kilometers south-east of Beaune. 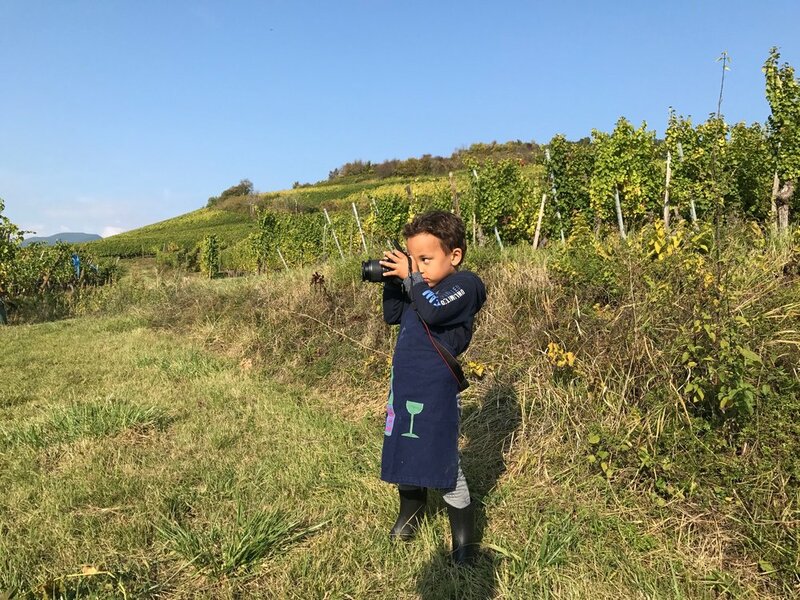 Domaine Weinbach: Located at the foot of the majestic Schlossberg hill in Alsace, this family owned winery is run by Catherine Faller and her son, Théo. Les Alexandrins: Located in the Northern Rhône Valley, Domaine & Maison Les Alexandrins is a collaboration among Nicolas Jaboulet, Guillaume Sorrel, and Alexandre Paso. Clos Triguedina: Found in southwestern France, Clos Triguedina is currently led by Jean Luc Baldes. Thibault Liger-Belair: Located in Nuits-St.-Georges, in the Côte de Nuits subregion of Burgundy, the domaine has been in the Liger-Belair family for 250 years. 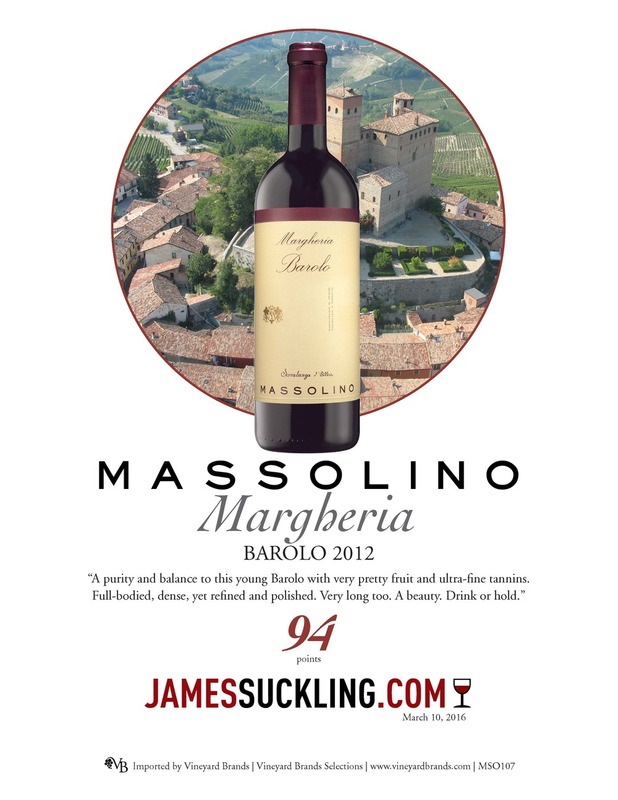 Massolino: Located in northern Italy in the Piedmont region, the Massolino estate was founded in 1896. Tablas Creek Vineyard: West of Paso Robles, on California's Central Coast, Tablas Creek is named after the small creek running through the property and the the 120-acre site sits twelve miles from the Pacific Ocean. You can find more detailed harvest updates on their blog. Produced exclusively in the Duoro Valley of Portugal, Port is a fortified wine with a history reaching back to the times of the Roman Empire. 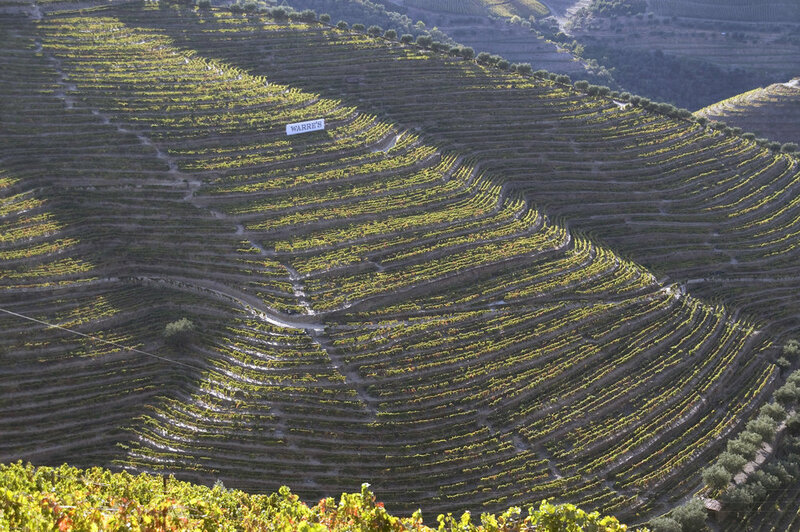 The wine producing Duoro region is the third oldest protected wine region in the world. Warre's Port, like the wine it makes, has an extensive history. The firm that became what we know as Warre's was established in 1670 as a trading company, exporting wines, olive oil and fruit, and importing dried cod and English woolen goods. Over time the company grew and evolved. By the close of the 18th century, Warre's had become one of the leading companies exporting port. The Warre family, for whom the company is named, arrived in Portugal in 1729 when the first Warre joined the trading company. This William Warre was born in India where his parents and grandparents were members to the East India Company. The second William Warre made immense contributions, serving as a member of His Majesty's Consul. The third William Warre is known not only as an important figure in port, but in British and Portuguese military history. He was invaluable in the fight against Napoleon Bonaparte and his invading armies and in the recovery of Portugal's independence. Not to mention, this third William Warre supplied the Duke of Wellington with Port from Warre's. Today, the Symington Family (whose own history and involvement in Port spans over 350 years and 13 generations), are owners and managers of Warre's Port. Currently six members of the Symington Family are actively involved in Warre's day to day management. The family is part of the exclusive Primum Family Vini- a group of eleven leading wine families in the world (whose membership includes another member of the Vineyard Brands family, the Perrins). Port has a rich, luscious style, with considerable aging potential. The fermentation of Port is suprisingly short- only about two days- as it is a fortified wine and a natural grape spirit is added to the fermenting juice. Warre's Vintage Ports are known for their elegance and finesse, intense red fruit flavors and floral violet and "esteva" aromas. Warre's Port has certainly come a long way from its days as a trading company. Today the company makes a variety of excellent Ports. Port, too, has come a long way over the years. Today it is a popular drink and can even be used in cocktails. White Port: Produced from white grape varieties, aged for an average of three years. Fresh and invigorating, an excellent aperitif. In summer, it may be served over ice. Ruby: A robust, young, fruity port aged an average of three years in wood. King's Tawny: An elegant, mellow tawny aged three years in casks. Warrior: Vintage character port is oldest brand port in the world. It is a blend of top quality ports matured in wood for six years then bottled. Otima 10-YearTawny Port: An outstanding 10Year OldTawny Port with a light delicate palate. Aged all of its life in wooden casks, it has a nose of dried fruits and walnuts, and flavors of nuts highlighted by mature fruit: well-balanced and with a long, fresh finish. Needs no decanting and can be served slightly chilled as an accompaniment to cheese, nuts or dried fruit after a meal. 20 Years Old Tawny Port: Cask-aged for 20 years, this tawny port has the classic hallmarks of Old Tawny, namely delicous soft raisiny fruit, a glorious nutty bouquet, superb balance and a long, lingering finish. Otima 20-Year Tawny Port: This more modern style of tawny port epitomizes everything that is great about a superbly balanced Twenty Year Old Tawny; the translucent copper-colored tone of the wine is matched by the beautiful soft nutty aromas gained by a full twenty years aging in seasoned oak casks. Otima20 is rich and delicate, but never cloying, the tannins and acidity ensure balance and perfect length. Late-Bottled Vintage Port: Selected casks from a particularly good vintage, but bottled four years after the vintage rather than two years. Warre’s produces a traditional LBV which is neither fined nor filtered. The result is a wine that has true vintage character but because of the extra barrel age is sooner ready to drink. Quinta da Cavadinha: Vintage port from the 35 hectare “quinta” or vineyard of this name owned by Warre’s. “Cavadinha” means “well tilled” or “well nurtured”, and this property is one of the nest in the Alto Douro. This single quinta wine is vinified, matured and bottled separately. In vintage years, it forms a substantial part of the Warre’s vintage blend. The 1978 was the first unblended vintage from Quinta da Cavadinha. Vintage Port: In outstanding years, port shippers declared a “vintage”. The best casks are selected and after eighteen months, the wines are blended and bottled. The wines are not ned or ltered and with bottle age will throw a sediment, hence the name “Crusted Port”. In recent years, 1977, 1980, 1983, 1985, 1991, 1994, 1997, 2000, 2003, 2007 and 2011 have been declared “vintage”. It seems for many wine-making families, wine rather than blood flows through their veins. This is especially true for the wineries Vineyard Brands imports considering they are all family owned, including Marqués de Cáceres. The Forners are a 5th generation wine family who have revolutionized wine growing in the Rioja region of Spain. Founded in 1970, the story of Marqués de Cáceres starts much earlier, in 1920, when Enrique's father and grandfather owned "Vinicola Forner," in Valencia, Spain. The Spanish Civil War forced the Forner's into exile in France. Although the family was forced to leave their home, they were immersed in one of the oldest wine growing regions in the world. While in France, the Forners purchased two châteaux in the Haut Médoc- the Bordeaux region. These two châteaux- Château Camensac and Château Larose-Trintaudon- are now recognized as two of the finest properties in Bordeaux. When Enrique Forner returned to his Spanish homeland he was armed with a wealth of wine knowledge and experience. He had learned from the best in France and was ready to establish a bodega. He selected the finest viticultural area Cenicero in Rioja Alta. In gently rolling hills bordered by the Ebro River, the region is as beautiful as it is fertile. Forner's first Rioja red wine was a 1968 vintage. Two years later Bodegas Marqués de Cáceres was officially founded, with the reputed oenologist from Bordeaux, Emile Peynaud, as wine consultant. Enrique Forner's impact can be seen throughout the Spanish wine industry we know today. Influenced by his time in France, Forner introduced the system of estate-bottling by limiting his source of grapes to those of the immediate area - a departure from the local practice of using more widespread sources of supply. He established the Union Viti-Vinicola, together with a selection of growers who supply the Bodegas Marqués de Cáceres with grapes; this restricted source of grapes gives a consistent style and character to the wine. He along with six other bodegas, the "Magnificent 7", was instrumental in reforming the rules of the Rioja D.O. (Denominación de Origen). This ensures quality and high standards for the wines of Rioja. Marqués de Cáceres gained its distinctive name from the actual Marqués de Cáceres in 1974 who became a founder-shareholder of the Bodega. The marquesado has its origins in the XVIII century and was granted by the King of Spain to the Captain of the Royal Spanish Navy Don Juan Ambrosio García de Cáceres and Montemayor in gratitude for his outstanding services to the Crown in the war of the Kingdom of the Two Sicilies. Enrique Forner retired in 2007, and his daughter, continuing the family legacy, took over control of the bodega. Marqués de Cáceres celebrated its 40th anniversary in 2010 as a leading brand in Spain and around the world and is available in more than 120 markets. Marqués de Cáceres White is made from 100% Verdejo grapes from Rueda. Very fresh bouquet with citrus and floral notes. Deliciously refreshing in the mouth with pleasant vivacity and long-lasting flavours. Marqués de Cáceres Antea Barrel Fermented White, produced from Viura grapes, with a small percentage of Malvasia. This fine wine is elegant and complex, with a bouquet of ripe apples, and a hint of vanilla in the rich fruit. Marqués de Cáceres Satinela is a delicate, fruity, slightly sweet white wine, made from Viura grapes, with a small percentage of Malvasia. The grapes were harvested late in their maturity, very ripe and concentrated. Aromas of apricot, peach, and acacia flowers. Marqués de Cáceres Deusa Nai Albariño from Rias Baixas. The name Deusa Nai means “mother goddess”, referring to the bounty of the earth. A fresh and fragrant bouquet with mineral notes and a hint of grapefruit and mandarin orange. With refreshing acidity and good length, ready to be enjoyed now but will continue to develp in bottle. Marqués de Cáceres Rosé is dry, very fruity, fresh and light, with a delicate pink color. It is made from Tempranillo grapes (80%) and Garnacha (20%) selected from the highest slopes of the Rioja Alta. It is cold-fermented and undergoes a brief maceration, which imparts to the wine its pink color. Marqués de Cáceres Excellens Sauvignon Blanc, Rosé and Red A selection of wines tailored to on-premise accounts with limited production, sourced from premium vineyards in Rioja for the Red and Rosé, and in Rueda for the Sauvignon Blanc. Marqués de Cáceres Crianza, noted for its spicy varietal character, its balance and lingering finish, is made from 85% Tempranillo grapes, with the balance split between the Graciano and Garnacha Tinta varieties. The wine is aged in small barrels of French oak for 12 months and in the bottle for at least 14 months. Marqués de Cáceres Reserva Tempranillo (85%), and Graciano and Garnacha Tinta (15%). 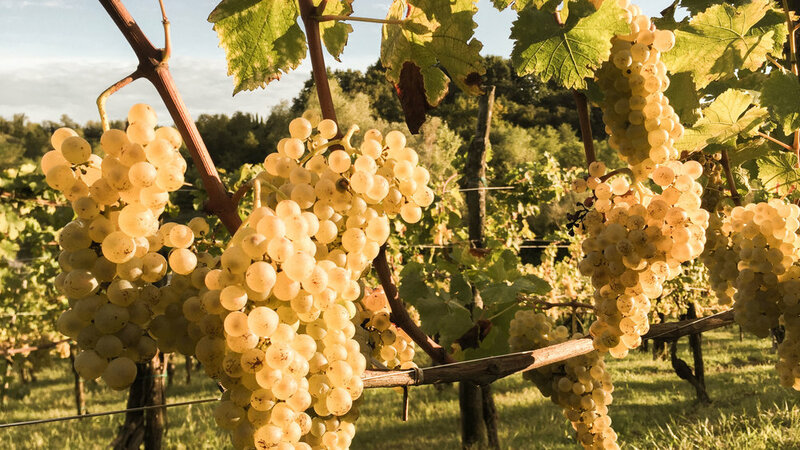 The grapes are selected form vineyards that are well exposed to the sun, and from a considerable portion of older vines, that produce lower yields. The Reservas are aged in barrels from central France for 22 months, followed by 2 years or more in bottle. It is made only in the best vintages, a rich and velvety wine with great depth. Marqués de Cáceres Gran Reserva from old vines, Tempranillo (85%), and Graciano and Garnacha Tinta (15%), aged up to 26-28 months in oak and up to 4 years in the bottle. Produced only from vintages classed as “excellent” or “very good”. Marqués de Cáceres MC 100% Tempranillo, this choice wine is made from a selection of grapes grown in vineyards of very limited production. Aged in new French oak for 15 months, the MC has a fresh bouquet that opens out with notes of blackberries, violet and delicate spices. Rich and full in the mouth with good structure, wrapped in delicious, rounded tannins. Marqués de Cáceres Gaudium (Latin: “satisfaction, joy, pleasure of the senses”) is made exclusively from Rioja’s finest vineyards that are planted with old vines which produce a very limited yield. A rigorous selection of the best grape varieties - 95% Tempranillo and 5% Graciano - are handpicked to ensure optimum maturity. Aged in new French oak barrels for 18 months and a minimum of 24 months in bottle, thus achieving the elegance which characterizes this great wine. Mandela Day is celebrated internationally every year on July 18. The day celebrates Madiba’s (Nelson Mandela’s clan name) life and legacy by promoting acts of service and positive community change. Nelson Mandela fought for social justice for 67 years, so Mandela Day asks for individuals to start with 67 minutes. South African winery MAN Family Vitners, located in Stellenbosch, knows the importance of giving back to the community. Like the saying goes, “charity starts at home,” so last year, MAN decided to devote their #67 minutes to one specific charity in the immediate community. Just down the road from MAN offices in Jonkershoek is Akkerland pre-school. Akkerland pre-school, or crèche, cares for two age groups: babies and toddlers up to three years old, and ages 3-6. July is South Africa’s coldest month, so much of MAN’s work for Mandela Day was centered on ensuring the preschool was prepared for the cold weather. Everyone from the farm workers at MAN to the office staff came together to serve the preschool in a variety of ways—from buying carpets to cover the floors to donating educational toys and books to buying warm blankets and clothing. While volunteering at the preschool, one of MAN’s employees, Maia Bezuidenhout, noticed two young brothers, Imbo (2 years old) and Sohiso (5 years old). These two brothers, raised by a sickly single mother, were especially unprepared for the cold weather. So Maia went to the mall to buy them a few pairs of warm clothing and shoes. A few months after Mandela Day, Maia ran into Imbo, Sohiso, and their mother. The boys’ mother had not forgotten and was so grateful for the help. This year MAN visited Akkerland in June to prepare for and see how they could best serve on Mandela Day. There, they learned Imbo and Sohiso’s mother had passed away and they were being raised by an aunt far away. While not every story has a happy ending, and while often an act of service might feel like only a drop in the bucket, the smallest devotion of time and the smallest act of service can truly make a difference and have a ripple effect. This Mandela Day, MAN again spent time at Akkerland, fixing cots, preparing the school for winter, and making sure they had supplies, from nappies to blankets. But MAN’s relationship with the preschool doesn’t stop after 67 minutes or even after a day. The team plans to make monthly visits to the preschool to spend time with the children, to take them to lunch, and perhaps to focus on specific families in need (inspired by Imbo and Sohiso). MAN sees the importance of giving back to the community, keenly aware of the overwhelming needs of the underprivileged and underserved in the community. MAN believes in promoting change and constant progress. National Dog Day was August 26. In celebration we're sharing some of our favorite vineyard dogs. After all, dogs are traditionally man's (and woman's!) best friend, and we like to think wine is too. Tablas Creek: Located just west of Paso Robles in California's beautiful Central Coast, Tablas Creek farms organically and received their organic certification in 2003. Much of the vineyard uses Biodynamic techniques, including a herd of sheep, alpacas and donkeys. These friendly dogs try to keep their other four legged friends in line, as well as welcome visitors to the vineyard. Domaine Alain Gras: over 12 hectares, primarily located in St. Romain, Domaine Alain Gras produces beautiful whites and reds. Ernesto Catena Vineyards: Fourth generation winemaker Ernesto Catena founded Ernesto Catena Vineyards in Argentina to truly make art. Both the farm and vineyard are biodynamic, allowing for plenty of friendly farm animals and dogs. Hamilton Russell Vineyards: Hamilton Russell Vineyards is known for making some of the best wines South Africa has to offer. 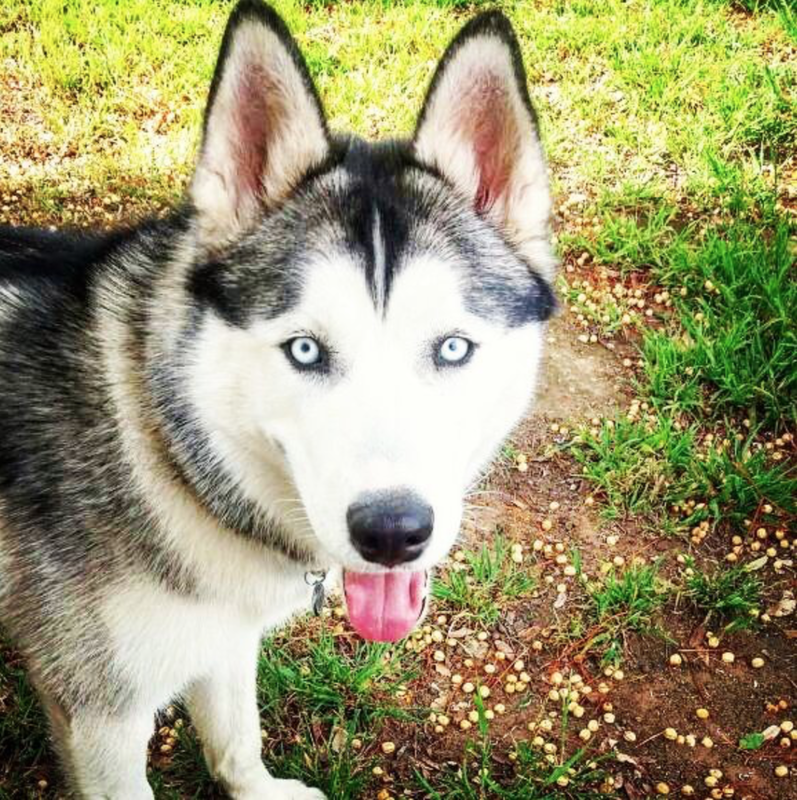 Owners Olive and Anthony also have some of the best dogs South Africa has to offer. Chamonix: Deep in the wine growing region of Franschhoek in the Western Cape of South Africa, Chamonix makes well-respected wines. 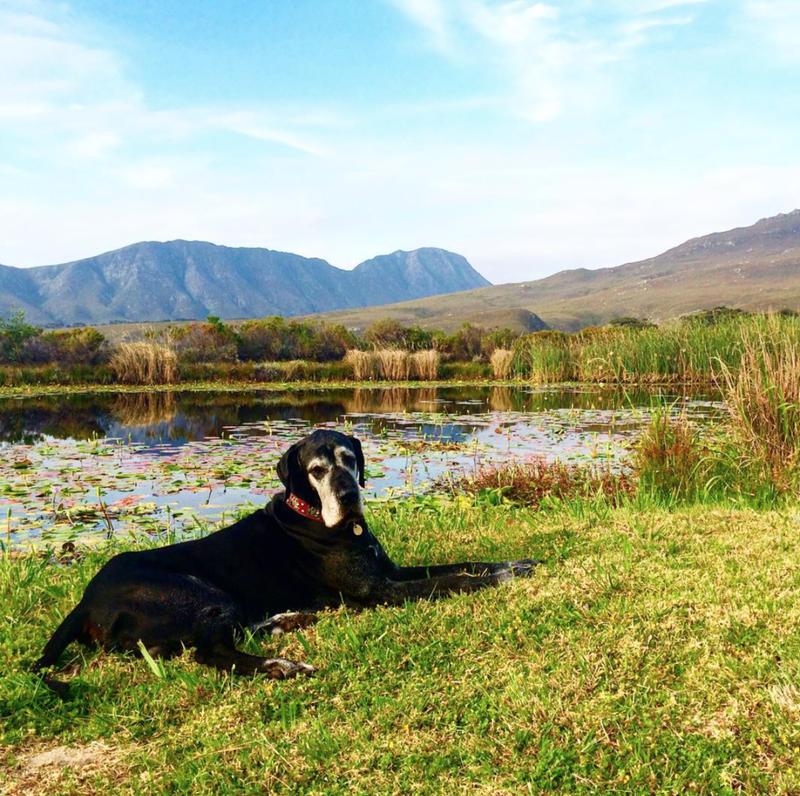 Winemaker Thinus Neethling has a beautiful dog that makes an appearance at the vineyard from time to time. Will You Accept This Rioja? If you’re a fan of the Bachelor/Bachelorette franchise or been active on social media this week, you might have seen that current bachelorette Rachel Lindsay, along with her three remaining suitors, recently took a trip to Spanish wine country. It’s hard to imagine a more romantic setting than rolling hills, medieval villages, and rich vineyards. Located in northern Spain, Rioja is an easy driving distance from popular cities like Madrid, Bilbao, and San Sebastian. The Rioja region is one of the greatest wine growing areas in the world. But don't be confused, non-Spanish speakers! Although at first glance “rioja” looks similar to the Spanish word for red- rojo- the region produces a variety of wines including whites, reds, and even rosés. The region has been producing wines for over 200 years, but still isn’t as well known to many consumers as other regions. So if you’re more familiar with French wine than Spanish, the Rioja region is often compared to the Bordeaux region of France. High quality wines at a variety of taste and price points abound. Rioja has the most acreage under vines of any wine region in the world- over 140,000 acres of vines yielding 250 million liters of wine annually. There are over 500 wineries in the region—ranging from small, more traditional cellars to large commercial producers. If Rachel’s quest for love has led you on a quest for love of your own, let us introduce you to a winery sure to win your heart (and your tastebuds)-Marqués de Cáceres. The story of this winery is practically made for TV (just like the Bachelorette). The Forner family fled Spain during the Spanish Civil War. Finding refuge in France, Henri Forner and his brother Elysée bought and restored two antiquated and abandoned châteaux. These two châteaux are now recognized as two of the finest properties in Bordeaux. Once returning to Spain, Henri decided to establish a bodega of his own in Cenicero, in Rioja Alta. In gently rolling hills and bordered by the Ebro River, Marqués de Cáceres is the perfect setting for a storybook romance…is it really any surprise the Bachelorette chose Rioja? Drawing on his experiences in Bordeaux, Henri Forner introduced the estate-bottling used in Bordeaux—limiting his source of grapes to those in the immediate area. 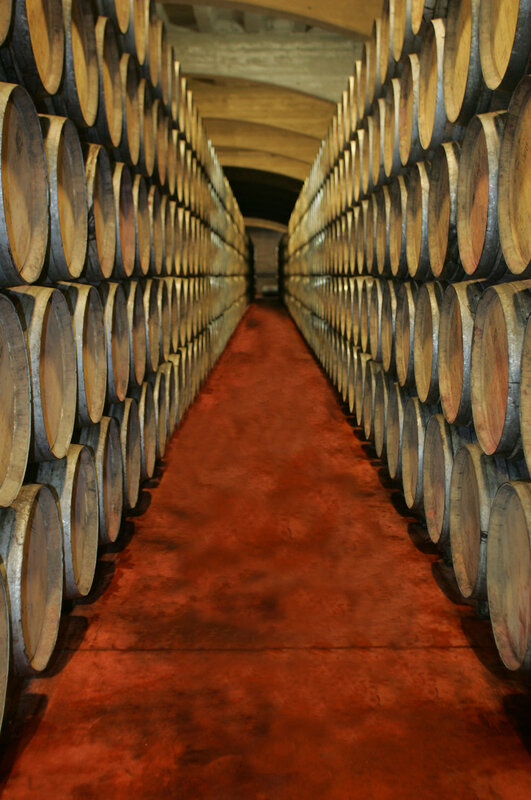 French winemaking techniques and expertise have been applied to native Spanish grapes, producing one of the finest modern Riojas. Marqués de Cáceres has stayed in the Forner family ever since. Henri’s daughter Cristina is at the helm and leading the winery to new heights and acclaim. Curious to try the wine for yourself? Pick up a bottle and fall in love. Will you accept this rioja? We know we do! Hamilton-Russell wines are widely regarded as the best in South Africa and among the finest in the New World. But their impact stretches far beyond the wine industry. Wine has the ability to bring people together over a meal or an aperitif, during happy hour or an after-dinner drink, but at Hamilton-Russell vineyards it also has the ability to bring the community together. Hemel-en-Aarde Valley Pre-School is located on the grounds of the Hamilton-Russell. Education is vital to progress, something of which Anthony Hamilton Russell was keenly aware. Originally a daycare for the farmworker's children, the school has grown and advanced to be an Early Childhood Development Center for the community. We are so proud to work with Hamilton-Russell for their outstanding wines and their extraordinary commitment to making a difference. Wines of South Africa recently profiled the unique school in a blog post. "We arrive at Hemel-en-Aarde Valley Pre-School and a flurry of activity greets us, as we walk through the door. Kids look up, smiling from their desks, but not for too long... they are busy with colourful drawings that clearly require concentration and effort, which they don’t just give up for anybody! Outside, the lawn is a brilliant green, as the sun peers down into this gentle valley. This neatly maintained building, on the grounds of Hamilton Russell Vineyards, has been a massive stepping stone for many a youngster from the communities nearby, we are told. Little Eli even took his very first steps here, after joining from Volmoed Farm when he was just eleven months old. The school is run by 4 ambitious teachers - Elzinda, Mendine, Ashlin and Emmie, all locals, as well as Zelda; a cleaning, cooking jill-of-all-trades. We are told that each of the adults have made lifelong friendships here, and it’s clearly the same for the kids. Showan and Jody are a legendary pair who found each other on the swings one day. One likes to think this bond will last long into their school careers. The school was first built by Anthony Hamilton Russell, in 1996, as a daycare for the farm employees’ children. In 2013, the teachers decided to upgrade the facility, to an Early Childhood Development Centre. This meant the children were not only safe while their parents worked, but also able to learn valuable skills. The school quickly grew from 20 students to 48, who came from many nearby Hemel-en-Aarde and Zwelihle communities. We are quickly reassured though, regardless of what the future brings, that there will always a place for local-living kids, like twins Showan and Shannice. Children who receive a quality-level of early childhood development have a much better chance of becoming constructive members of society. The years that these Hemel-en-Aarde kids spend talking, drawing, counting and playing in this classroom, will have an impact that lasts long beyond the here and now. Recently, four classrooms, three bathrooms, an office and an impressive industrial kitchen were built. This upgrade means the kids can now receive a homemade vitamin-rich breakfast and, when lunchtime rolls around, Zelda is their rockstar. Her special nutrition programme is monitored by Ukwanda, the Division of Human Nutrition from the University of Stellenbosch. She serves her little squadron hearty portions of meat and vegetables and, in return, we are amazed to see the kids come back for seconds just minutes after their first round! As the afternoon wears on, it is pleasantly surprising to see toddlers sit unattended at the school’s Leapfrog Computers. They are completely captivated by the digital world and their still silence has us in awe. As a policy, all of the school’s students become computer literate from a very early age, thus arming them with real-world life skills before they are five! It’s no surprise their headteacher, Elzinda, makes a big fuss when her kids graduate and leave for big school. Sam and Renfred, graduated last year. Apparently, these chuckle brothers were a tight team throughout their pre-school career! The dream, at Hemel-en-Aarde Valley Pre-School, is to make their small campus more green and self-sufficient. There are further plans down the line for a food tunnel, to grow the school’s own vegetables, as well as a chicken coop. With more funding from the community, they are hoping to take on a previously-unemployed person, to create a vegetable garden in which the children can develop their own green thumbs. Meanwhile, within the school’s walls, they plan to funnel any further investment towards new software for their Leapfrog computers. One can only imagine the well-rounded characters this institution is going to develop in future. We hope and trust that all the help this school needs will come their way!" You can also follow the pre-school on Facebook here or learn more on Hamilton-Russell's website here. Next time you drink a bottle of Hamilton-Russell Chardonnay or Pinot Noir you know it's not just good wine--it's wine for good. April 17 is officially Malbec World Day! Why April 17? On that day in 1853, with the support of Mendoza’s governor Pedro Pascual Segura, a bill was submitted to the Provincial Legislature for the foundation of a Quinta Normal and a School of Agriculture. The bill was enacted as law by the House of Representatives on September 6th, 1853. Malbec has a history dating back hundreds of years. It was served at the wedding of Eleanor of Aquitaine to Henri II. Happen to have forgotten their anniversary? We have you covered. 1152 (over 800 years ago). Was once known as "black wine"...for fairly obvious reasons. Malbec is one of the darkest wines you can find. TintoNegro literally means Black Wine. While you might associate Malbec most closely with South America (and Argentina in particular), Malbec traces its origins back to France and was once the most widely planted grape in the country and found in many Bordeaux blends. In 1870, phylloxera destroyed vineyards in France and ruined the Malbec vines in Bordeaux. This same pest has never taken hold in Argentina. 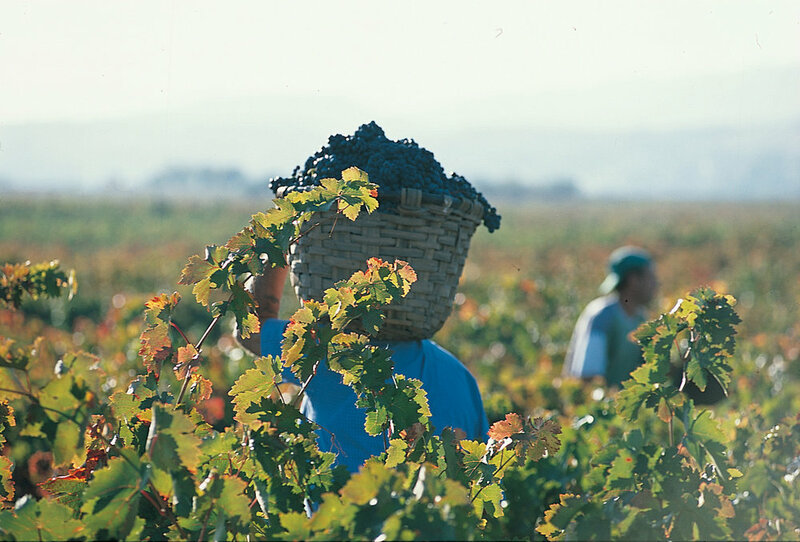 By the end of the 19th century, viticulture had boomed in Argentina (in part thanks to Italian and French immigrants) and so did Malbec, which adapted quickly to the varied terroirs of Argentina. Now Malbec only accounts for about 10,000 acres in Cahors and about 100,000 acres in Argentina. Malbec can also be found in countries throughout the world including the US and New Zealand, but Argentina has nearly 70% of all acres of Malbec in the world. Malbec vines are very sensitive to weather and pests (like phylloxera). They've thrived in high-altitude Argentina. Argentina is now the 5th largest wine producer in the world. Argentinian Malbecs are fruit-forward, plummy, and velvety with prominent new oak. French Malbecs have more structure, firmer tannins, an inky dark quality, and are earthier. BOTH have essential Malbec flavors of blueberry, cherry, and plum. It’s hard to walk into your local wine shop or supermarket and not notice the stunning rows of jewel-hued rosés. And considering the boom in popularity that rosé has enjoyed the past several years, there’s a strong chance that these beauties ranging in color from the palest of pinks to outrageous magentas will be featured prominently. As we explored in a recent blog post, rosé has gone from being just another wine to a cultural phenomenon in a few short years. However, most people, even the most ardent fans, have little idea of rosé’s fascinating journey from grape to glass. 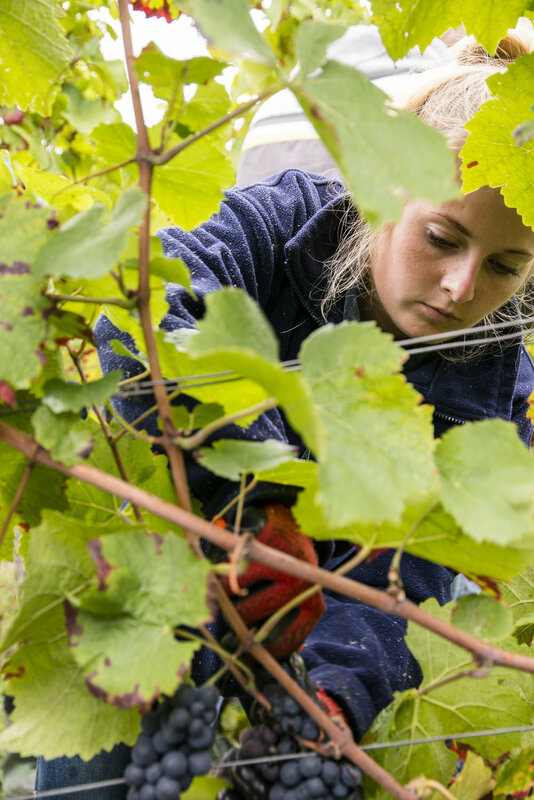 While researching this article, I was fortunate to speak with two winemakers very knowledgeable about rosé production, Chelsea Franchi of Tablas Creek Vineyard in Paso Robles, CA and Simon Batarseh of August Kesseler in the Rheingau region of Germany. It is a common misconception that rosé is made by simply combining red and white wines together. While this technically can occur, it is quite rare when making quality rosé. Franchi, who oversees much of the rosé production at Tablas Creek, started our conversation speaking about the two most common methods of producing rosé: saignée and direct press. The saignée method involves bleeding off juice from red wine tanks before it has had a chance to take on too much color from the red wine skins (this process is called maceration). This labor-intensive method is interesting and controversial because it is often used as a way to enhance and concentrate the remaining red wine. Many rosé advocates consider it an affront to rosé because it is the by-product of red wine production. However, both Franchi and Batarseh praised this method for contributing intensity of flavors and for the amount of input they have while utilizing it. At Tablas Creek, the juice sits on the skins for approximately 24-72 hours before about 20% is bled off and subjected to a cold fermention. Most of this wine then becomes their serious, darker colored rosé called Dianthus (named for the flowers commonly known as “pinks”). Dianthus is generally Mourvèdre-based, a nod to the rosés of Southern France, specifically the Bandol area. Franchi attributes this wine’s watermelon essence to the Mourvèdre used in the blend. At Kesseler about 20% of the juice from wonderful up to 80-year-old Pinot Noir vines is bled off then fermented. Batarseh leans on this wine to contribute color and tannins to the final blend. The other common method of making rosé involves direct pressing of the grapes. This method is the most common and generally is considered the benchmark for crafting quality rosé. Both Franchi and Batarseh praised the fact that crop levels, sugar levels, acidities, and harvest dates can all be controlled in the vineyard and tailored to make the absolute best rosé. They both also press the juice off the grape skins without any maceration time resulting in a stunning pale pink color. Often you will see this wine labeled as vin gris. At Tablas Creek, this limpid direct press juice is destined to become their acclaimed Patelin de Tablas Rosé. Franchi said that they prefer to co-ferment their Grenache, Mourvedre, Counoise, and Syrah juice for this wine. This wine is definitely styled in the tradition of the great Provençal rosés with its dominant bright strawberry notes coming from the majority Grenache. At Kesseler the direct press juice is blended with the saignée juice for the final wine. Batarseh likes the interplay of qualities produced by using both methods, noting that the direct press juice brings a light, bright, acid-driven quality to the final wine. I asked Franchi what her favorite grape is to work with in the production of rosé. After some thought she answered, “Grenache,” and referenced the absolutely heavenly, heady aroma released by the vats of fermenting Grenache in the cellar. Indeed, when studying many of the great rosé-producing areas of the world, Grenache often seems to pop up. It makes sense when considering that Grenache is a very thin-skinned grape and overall has less color-lending phenolic compounds than other red grapes. Franchi also referenced the little-known Rhone Valley grape Counoise as contributing a nice softness and darker red fruit flavors to their rosés as well as those produced in Southern France. Often Syrah is also added also its wonderful spicy character. At Kesseler, Batarseh works exclusively with Pinot Noir for rosé production. Once again we find a grape with thin skin and low levels of phenolic compounds. It’s no surprise that in most of the world’s great Pinot Noir regions there is also usually concurrent rosé production (think Marsannay in Burgundy, Oregon, Germany, and the Loire Valley). Producers in these regions get the dual benefits of producing a gorgeous berry-scented rosé and intensifying the often light juice destined for their Pinot Noir bottlings. At Kesseler, considered one of Germany’s premier Pinot Noir specialists, their rosé shows beautiful berry and cherry notes while maintaining an elegant and exciting tension. It’s definitely refreshing but has the stuffing for year-round drinking. Next time you’re buying a bottle of rosé for the lunch table, pool, or just a summer evening with friends, talk with the wine specialist or turn that bottle over and read the back label. Besides the important visual clues from the color, you’ll gain some great perspective on what’s in a bottle by simply knowing how it’s made. And don’t be embarrassed for buying it! As Franchi told me, “The stigma is over. Rosé is one of the most delicious, versatile, and food friendly wines out there.” Think pink!! 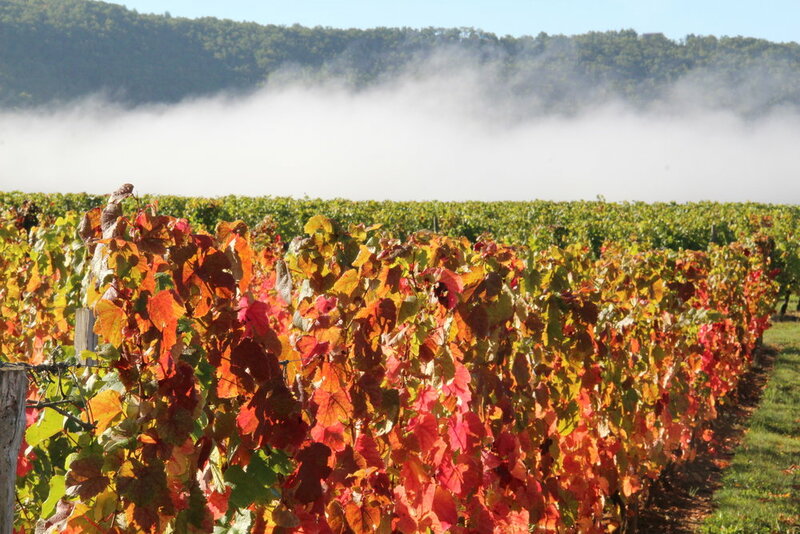 We are so excited to welcome Domaine de Courcel to the Vineyard Brands portfolio! You can’t get much more Burgundian than Domaine de Courcel. Family-owned for over 400 years, the winery is located in the village of Pommard on the Côte de Beaune. Domaine de Courcel is known as one of Pommard's grandest domaines. Gilles de Courcel, the current owner along with his three sisters, has a strong wine background. One publication described him as “born in the vineyard,” just like the wines. Gilles has a business degree and worked in the industry in Beaune, Reims, and Bordeaux before returning home to Pommard. The vineyard is cultivated using organic farming techniques, careful age-old practices, and modern methods. Low yields, late harvesting, whole bunch vinification, cold maceration, long cuvaison (barrel fermentation) and a lengthy élevage (maturation) with minimal racking are all key to the wines' excellent quality. Almost three-quarters of the domaine is composed of the prestigious Premier Crus, making it one of the largest estates of Pommard Premier Crus. 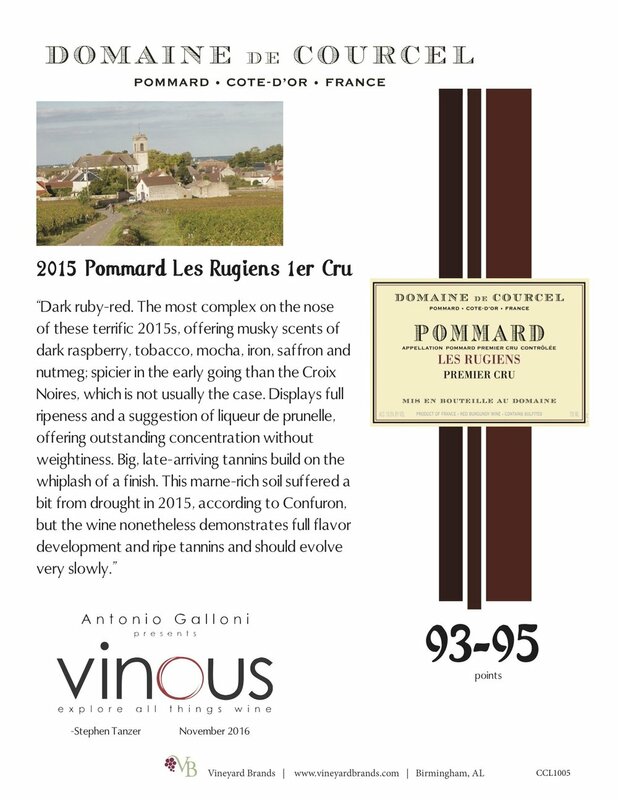 The four Pommard Premier Crus are Le Grand Clos des Epenots, Les Rugiens, Les Fremiers, and Les Croix Noires. Le Grand Clos des Epenots and Les Rugiens are in a class of their own in Burgundy. The Domaine's other three lots are Les Vaumuriens, Bourgogne Pinot Noir, and Bourgogne Chardonnay. 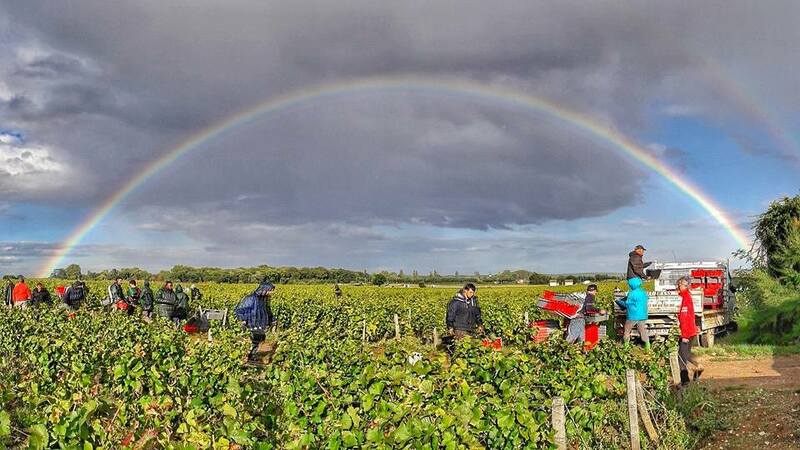 Domaine de Courcel wines are known for their elegance, minerality, as well as their strong tannins and great density, something rare on the Côte de Beaune. The wines are subtle and rich with a remarkable ability to age. Annual production never exceeds around 30,000 bottles. The wines are frequently mentioned and reviewed in leading wine publications, some of which are featured in the slideshow below. The history of the Massolinos and their wine became entwined with the history of Serralunga d’Alba in 1896, when Giovanni founded the Estate. Giovanni was the very first person to bring electricity to the village. An enterprising, tenacious and creative man, progenitor of a family that has made the combination of inspiration and tradition something to be proud of. Making wine with passion, in its land of origin, preserving the typical characteristics of the autochthonous grape varieties, being convinced that there is a deep and tangible link between the vines, hills and winegrowers, made up of affinities cemented, by habit, to the land. Since 1896, the Massolino family has been making wine this way, loyal to this philosophy and to the capacity for innovation in the name of tradition. In short, loyal to itself. 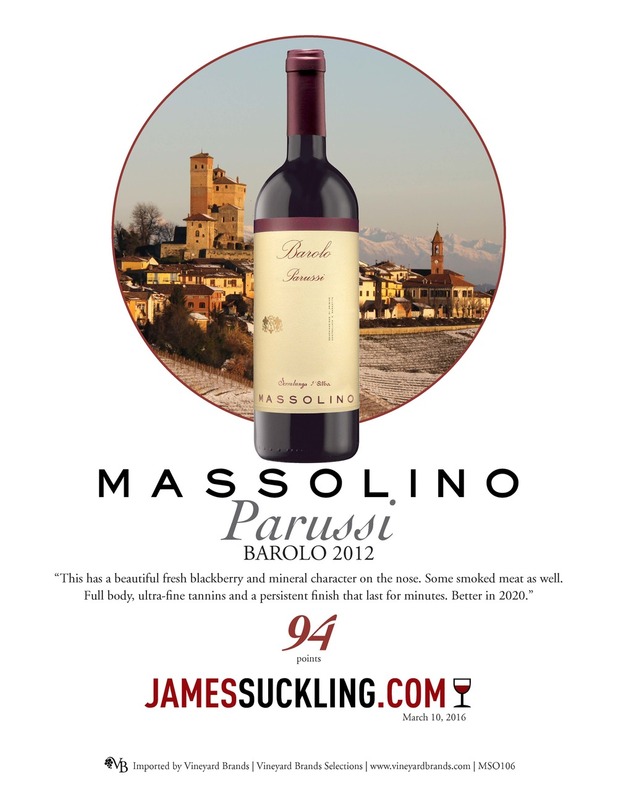 Massolino wines are the result of a privileged relationship with the vineyard, interpreting all its peculiarities and nuances. A relationship built up day by day, personally supervising every moment in the production chain in all 23 hectares of the estate. From the vineyard to the cellar, from the vine to the bottle. Calcareous soil with a good percentage of sand, adding elegance, mineral and spicy notes to the wine.